Our office is committed to providing each patient with an exceptional level of care with great attention to detail. At Frehner Family Dental our dedicated staff works together as a team to provide high-quality comprehensive care. From the moment you step through our doors you will be welcomed and greeted by our professional staff. We want your experience to leave you SMILING. Our patients are our most important asset. At Frehner Family Dental we strive to develop long-lasting, trusting relationships with you and we cherish you as our patient. The goal of family dentistry is for patients and dentists to work together to maintain good oral health. It's time to make an appointment for a teeth cleaning! If you don't have a family dentist, come see Dr. Frehner today for an appointment. 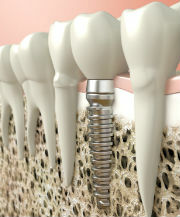 Implant dentistry is a popular option for replacing a missing tooth. Implants look and feel like natural teeth, allowing you to chew and speak just like you did before. Learn more to see if Implants may be right for you.